The Presbyterian Historical Society has significant ecumenical appeal. Not only is PHS the official record holder for non-Presbyterian groups such as the Federal and National Council of Churches , the American Sunday School Union, and the Religious News Service , we work with hundreds of patrons each year from beyond the denomination. But it is the national offices of the PC(USA) , along with mid councils, congregations, and individual church members, that provide the bulk of the society’s collection items and financial support. Such contributions were not always forthcoming from the Church—especially financial ones. American Presbyterians of the mid-nineteenth century, busy with the immediate concerns of founding congregations, carrying out the great commission , and grappling with transformative social issues such as slavery  and westward expansion, were slow to value their own past. 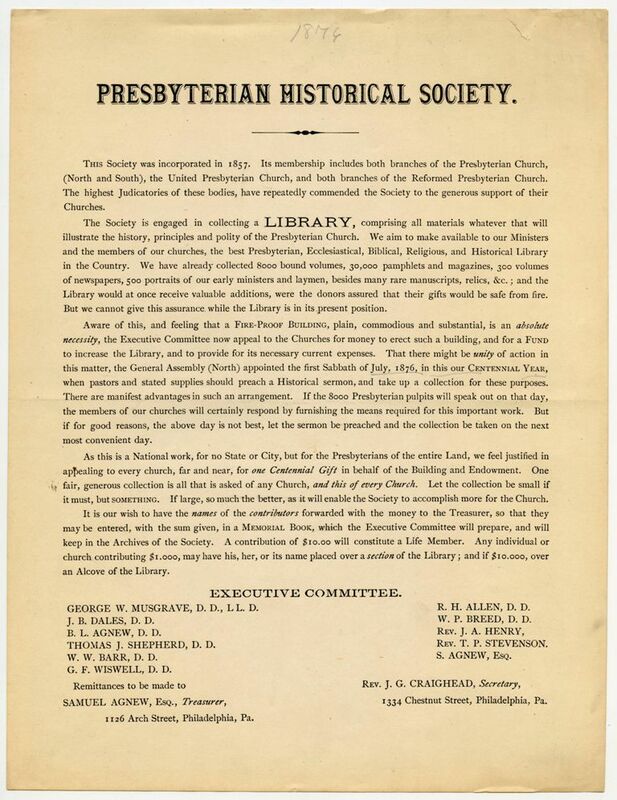 Formed in 1852, the Presbyterian Historical Society’s first years were financially shaky. Cortlandt Van Rensselaer , who was instrumental in organizing the society, made repeated appeals to synods and presbyteries to ask their congregations to take up a collection for a society endowment fund. Despite such pleas, a membership program, and even the publication of a society catalog , PHS’s finances remained far from secure. Adding to the pressure was the successful collecting of Samuel Agnew, the society’s first librarian and treasurer. 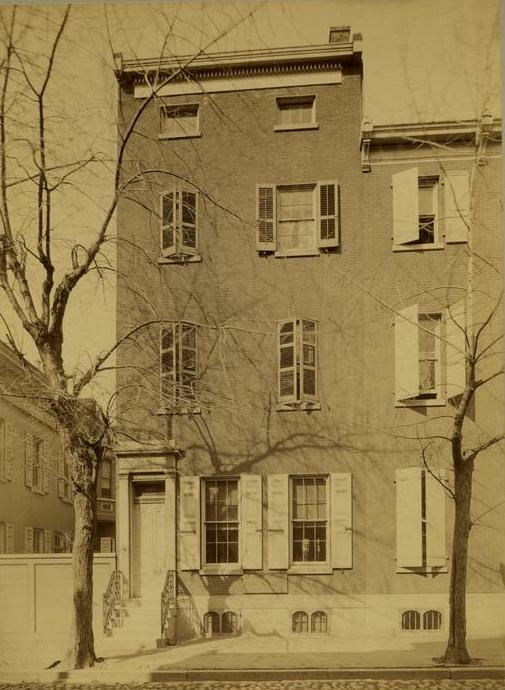 By 1870 the society had outgrown its original space in the PCUSA (Old School) Board of Publications building at 821 Chestnut Street in Philadelphia and moved its 20,000 publications and 500 portraits to a different location on Chestnut Street. Six years later the United States turned 100, and the Presbyterian Church wanted to celebrate. The 1873 General Assembly passed a resolution setting July 2, 1876, as the day when every pastor should deliver a sermon on congregation history. In addition, pastors were asked to send the sermon to the society for permanent safe-keeping. The assembly also recommended that each church take up a collection to help erect a fire-proof building for the historical society along with creating an endowment fund. The society provided recommendations to churches on writing histories. The guidelines stated that congregations should use paper of good quality, print legibly with superior ink, use margins on both sides, and bind pages together with strong linen thread. The Board of Publications even sold paper to congregations for the histories. Craighead persevered, getting results. As part of the executive committee collection effort the society received more than 600 congregation histories, 20 presbytery and synod histories, a history of the PCUSA’s foreign mission program, and 3 manuscript histories of individual missions. According to the society’s 1877 report, it added 2,000 bound volumes to its collection—an increase of 25 percent. Some histories came from out-of-the-way locales such as the gold mining town of Central City, Colorado. Not all were from 1876, however. The minister of the Third Presbyterian Church in Newark, New Jersey , had given a semi-centennial sermon in 1874 and wrote that it would be out of place to do another. He sent a copy of his original sermon to the society. The momentum lasted past the Centennial. The 1877 General Assembly reaffirmed its motion resolving that pastors should give prepared histories to the society and churches collect funds for a fire-proof building. At that year’s assembly, the society reported nearly $6,000 raised for a new building. The following year’s General Assembly rejoiced that the society raised an additional $14,000 for a building to guard the denomination’s history. The society successfully secured a fire-proof building when it bought a property on Race Street in Philadelphia for $12,000. PHS relocated there in 1879. Two of the three executive committee’s goals had been met. The society was not successful, however, in securing a large endowment. By 1897, the executive council reported that the fund totaled less than $1,000. The historical society would not receive a reliable long-term source of financial support until nearly fifty years later, in 1925, when PHS was fully incorporated into the work of the denomination as the Department of Historical Research and Conservation for the Presbyterian Church in the U.S.A.